Good news! Good news! Good news! Here is a good news for all the aspiring DJs. 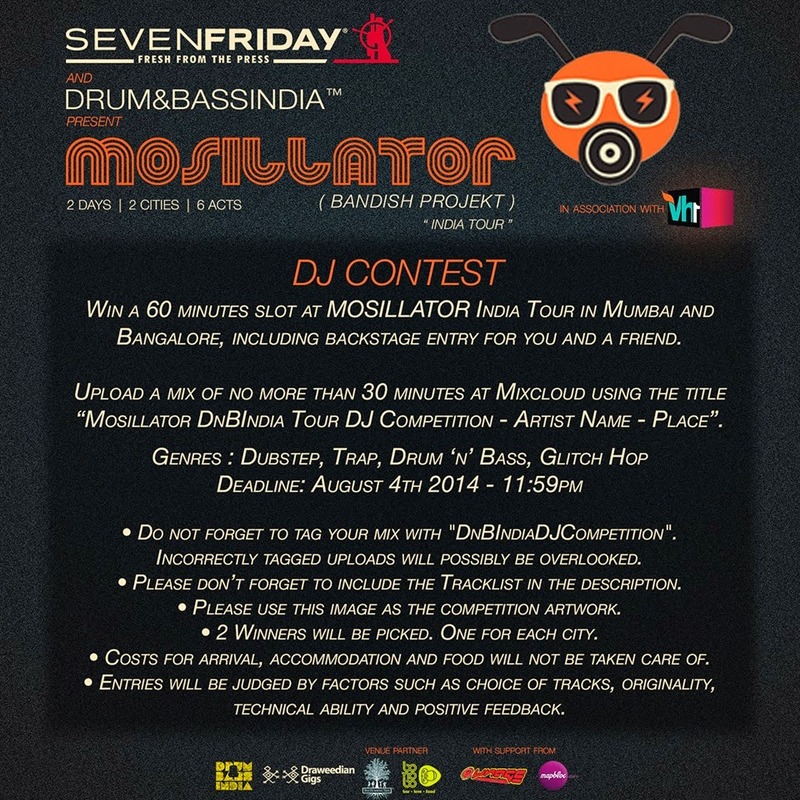 Here's a chance for you all to win a 60 minutes slot at MOSILLATOR India Tour in Mumbai and Bangalore, including backstage entry for you and a friend. Upload a mix of no more than 30 minutes at Mixcloud.com using the title “Mosillator DnBIndia Tour DJ Competition - Artist Name - Place where you want to play”. We will be announcing the winners on 6th morning. • Do not forget to tag your mix with "#DnBIndiaDJCompetition". Incorrectly tagged uploads will possibly be overlooked. • Post your mixcloud link on facebook and twitter with the same hashtag (#DnBIndiaDJCompetition). • Please don’t forget to include the Track-list in the description of your mix-tape on mixcloud.com. • 2 Winners will be picked. One for The Humming Tree in Bangalore and Bonobo - Bar.Love.Food. in Mumbai. • Costs for arrival, accommodation and food will not be taken care of. • Entries will be judged by factors such as style, choice of tracks, originality, technical ability and positive feedback.